The country of Italy has been one of the most popular tourist and sightseeing destinations for hundreds of years. The country is home to vast collections of art, a large number of historical museums and sites, and a wide variety of beautiful geographical landmarks. There’s hardly a city or village in all of Italy that doesn’t have a historical statue, cathedral, or museum. One of the most historical and oft-visited locations in Italy is found in the capital city of Rome: the Vatican City. 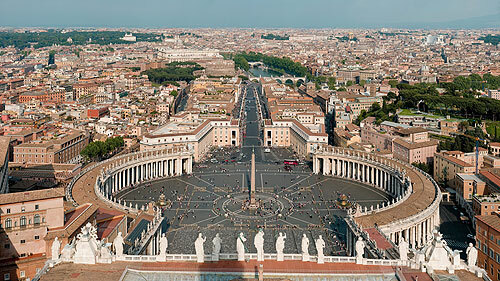 The Vatican is a landlocked, walled, sovereign city-state within the city of Rome. Not many people live within the true boundaries of the Vatican City—just over 800—and as the smallest independent state in the world, it takes up only about 110 acres of land. It was established in 1929 on behalf of Pope Pius XI, who was an outspoken critic of capitalistic greed. The Vatican City is an ecclesiastical state that is governed by the Bishop of Rome (the Pope) and other Catholic clergymen of varying national origins.. The Vatican City gets its money from the museums within its walls as well as the post office—the revenue from selling stamps, coins, museum tickets, and tourist souvenirs can add up quickly. Some workers also work in the industries of printing, making mosaics, and making staff uniforms. There’s also a bank within the city—the Vatican Bank—that works with customers all around the world. If you want to see an ATM that has instructions in Latin, you should head to the Vatican Bank today. It’s possibly the only ATM like it in the world. Vatican City also makes its own coins, but not euro banknotes. The country has had a special agreement with the European Union since 1999 and has used euros ever since, but since the issuance of euro coins is strictly limited, the Vatican doesn’t participate in that industry. The Vatican employs almost 2,000 people but had a deficit of more than 15 million euros in the year 2008. In fact, the Vatican City is now included on a list of countries at risk for money-laundering. The City is home to a range of incredibly famous art. St. Peter’s Basilica not only houses art by Raphael and Fra Angelico (among others), but also has seen architects like Bramante, Michelangelo, Giacomo della Porta, and Bernini. The famed Sistine Chapel, found in the Apostolic Palace where the Pope lives, is home to many beautiful frescos, including works by Perugino, Botticelli, and, of course – Michelangelo. On a map of Vatican City, the Apostolic Palace is right in the centre. The ceiling of the Sistine Chapel was painted by Michelangelo in the early 1500s. The frescos on the ceiling—and especially the piece known as The Last Judgement—are widely believed to be the best painting work of Michelangelo’s career. The Last Judgement is a massive work that takes up the whole wall behind the altar in the Sistine Chapel. Although it is now hailed as a classic piece of art, when Michelangelo first painted it, he was accused of not being appropriate and of putting his personal style over “appropriate” depictions of the scripture. As mentioned previously, this enchanting city is home to a little over 800 true citizens. Almost all of the citizens either live inside the actual Vatican or serve in diplomatic services in embassies throughout the world. Most of these citizens are either clergymen, officials of the state, or members of the Swiss Guard. Although there are many nationalities represented in the citizenship of the Vatican, all citizens have one thing in common: their religion. All Vatican citizens are Catholic, as are all the churches within its walls. Citizenship in Vatican City is based on the appointment to work in a certain capacity, as opposed to citizenship in other countries, which is normally based on birth from a citizen. That means when a Vatican citizen’s special assignment or appointment ends, so does their citizenship to Vatican City. There is no official language in the Vatican, but all official communications coming from the city are in Italian (unlike the Holy See, which only uses Latin).